Pohoiki black sand beach is one of the newest (August 2018) black sand beaches on the Big Island and is part of Isaac Hale Beach Park. This is a very beautiful beach in the Puna district. The rest of the video shows aerial footage of the Fissure 8 cone and the Pu’u O’o cone. The Island of Hawai’i is a place where many opposites meet: Fire and water, tundra and monsoon climates, rainforests and deserts, creation and destruction. All can often be found within just a few miles of each other and this gives a unique vibe to the Big Island which makes many people (us for sure!) fall head over heels in love with her. The latest episode of creation and destruction on Hawaii island is the 2018 Lower East Zone Eruption, during which lava surface flows between early May and early August destroyed over 700 houses and that covered, among many other things, some of the most beautiful and mesmerizing places in Puna: the Kapoho Tide Pools and the Ahalanui Hot Ponds. Land, for example. A LOT of lava flowed into the ocean during the LERZ eruption: 875 acres (3.5 km^2) of new lava delta was created. Some of this delta may collapse into the ocean again, but at the end of the day the Big Island will probably have grown by about one square mile! Black sand is another thing that was created in bulk. When hot lava comes into contact with water it quickly solidifies and often fragments or explodes into many small parts. These small lava cinders are then ground into fine black sand by the waves. Fun fact: all the black sand on Hawai’i’s beaches, at one point, was red-hot lava! This black sand was (and is!) being distributed over the nearby coast, which has caused many new black sand beaches to form. The new most-talked about beach on the Big Island is the one forming in front of the Pohoiki boat launch: (new) Pohoiki black sand beach. (Video credit: StrangeHawaii). Check out the first 7 minutes of this video to see what the hike to Pohoiki from Mackenzie State Park is like. Pohoiki is officially known as Isaac Hale Beach Park and is an extremely diverse natural area in the beautiful and lush Puna district. It includes a recreation area, several ocean thermal ponds, a (new!) beach, and is also a popular surfing spot. Pohoiki bay was almost filled with lava but, fortunately, the lava flow stopped a mere 230 ft (70 m) from the harbor. The popular surf breaks Bowls, Shacks, and dead trees, are no more, and part of the park, including the lifeguard stands, was covered with lava. Fortunately, the boat ramp and most of the the beach park survived. Now, lots of new black sand is gushing into the bay forming an ever growing black sand beach! The beach is quite steep at the moment and the sand is still coarse but it will get finer as the waves grind down the small lava fragments. Life is already returning to the ocean and land now that the eruption has and the whole beach is a pristine wonder to behold. 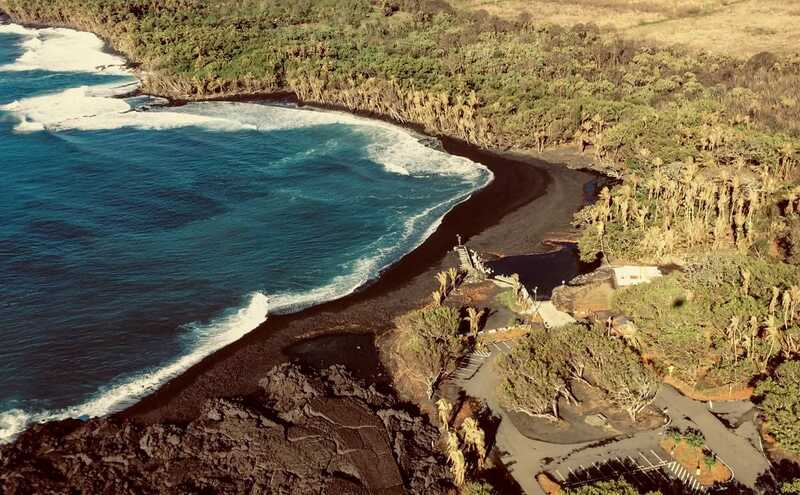 Isaac Hale Beach Park has now reopened after the LERZ eruption but the fate of the new black sand beach is still very uncertain. New black sand beaches like this often wash away again within a few years because no new sand is being provided (see for example the slowly shrinking Kaimu black sand beach). There also is the question of the boat launch. The Pohoiki ramp is the only boat launch in the entire Puna district, and many locals, fisherman and local tour operators are financially dependent on nearby ocean access. Because of the economic impact of the harbor it is possible that the bay will be at least partially dredged in the future to open the boat ramp once again. If this happens it is not clear how much it will impact the black sand beach now almost completely lining Pohoiki bay. 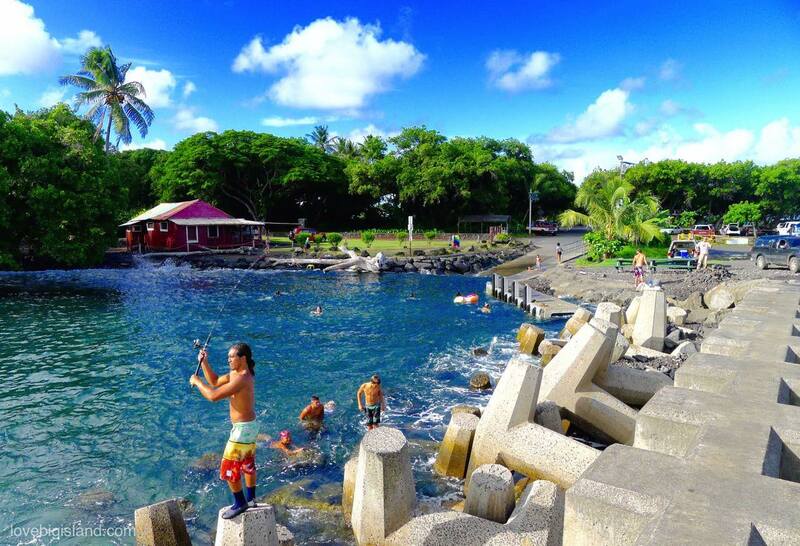 Before the 2018 LERZ eruption the Pohoiki pier and boat ramp were a great place to be in the water. Great news! The Isaac Hale Beach Park has reopened on December 6th, 2018. County officials are currently working diligently to restore the park after is was partially overrun by lava. The new park is dedicated as a safe and peaceful place for all families but not all services you’d expect from a county park are available yet. Please kōkua (help, assist) to keep the park a beautiful and safe place for your ‘ohana and everybody else. Park hours are from 9:00 a.m. to 6:00 p.m. There is no drinking water in the park yet: bring plenty of drinking water when visiting. There are portable toilets available. The lava flow created four Natural Ocean Thermal Ponds. The Department of Health is giving notice that these ponds are not disinfected and, due to the risk of bacterial infections, the public should not enter these ponds if they have open wounds. Enter these ponds at your own risk. There is a dangerous shore break on the new black sand beach and dangerous ocean currents which could cause injury. Enter the ocean at your own risk. Pohoiki Beach is located at the intersection of Pohoiki road and the scenic Kapoho-Kalapana road (route 137) in the Puna District of Hawai’i Island. These roads were overrun by lava but by November 2018 a new road between MacKenzie State Park and Pohoiki was cleared. Note that at the moment GPS directions to Pohoiki are not reliable since not all maps have been updated with the road closures due to the lava flows. The best way to get to the Isaac Hale Beach Park (starting from Pahoa) is to follow Hwy 130 all the way to the end, and then turn left onto Hwy 137, which now ends at Pohoiki. This route will take you also past the beautiful Kaimū Beach Park and over one of our favorite scenic drives.